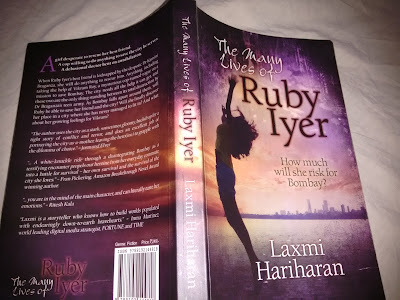 The Many Lives of Ruby Iyer is one of those books that had me dangling, unable to decide how to aptly judge it. This one was a mix bag where somethings had me sitting up and taking notice while some had me persevering to continue. First off, I loved the cover and the fact that this was a Dystopian thriller with our own Bombay featuring in it. Now Dystopia is a fairly new genre for me and so I was excited to read a story set so close to home. Next, the blurb attracted me and finally with these factors combined, I knew I had to take up this book to read. The initial chapters in the book are very slow and the protagonist, Ruby didn't endear herself to me here. She sounded like a person I would never like to be friends with. But then after a few chapters, the story starts developing and we get a new picture of Ruby. She is sassy, strong, independent sometimes foul mouthed, loves drinking tea and is fiercely loyal to her friends which she proves when she races against time to save her friend! The author's writing style is shiny and glossed and she shows that she has the talent of writing. Despite her great talent and engaging way of taking the story forward, at some places I felt as if she had overdone it all. The overzealous description and narration had me stopping multiple times and then re-reading to understand things again and again making this the book I took a long time to finish because several times I re-read the previous part because I felt as if I had missed something. The story is not our start-to-finish racy adventure that I had expected. It starts slow and multiple times you'll feel like stopping but midway it picks up speed and then rushes to an end that I felt didn't quite complete the adventure and left questions in my mind which maybe, will be answered in the next book. However, the trivia all through the book is interesting. The description of Bombay and its commuters, Ruby's friendship with her best friend, Pankaj was worth reading about. The subconscious appearances of her mother admonishing her had me feeling sorry for her and angry with her mom. All in all, The Many Lives of Ruby Iyer is a great effort, a different kind of story but still doesn't shine to its full potential. 3.5 out of 5 to it and recommended to all Dystopia fans. I will definitely be checking out the next part when it comes out. The Ruby Iyer Diaries: A Ruby Iyer Series Book for FREE!